If you’re tired of paying rent every month or need to find a bigger place to live to accommodate your family, then you may need to enter the home buying process. Looking for a home and exploring what’s out there is fun, but the actual buying process isn’t always easy. Follow this guide to learn how to buy a house when you’re ready to settle down in a place you love. Buying a house is an emotional experience. It’s easy to get caught up in the “what-ifs” of home buying when you start to look at houses and neighborhoods. The best thing you can do to stay grounded is to meet with a qualified mortgage professional and set a home budget before you even start looking. A good lender will provide you a prequalification letter which will outline what you can afford at various mortgage terms and interest rates. Similarly, there are various tools on the web you can use to learn how much home you can afford. Everyone has ideas for what they want in their dream home, from wrap-around porches to winding staircases. Unfortunately, the odds that you find everything you could possibly want in your home, in your budget, and in your area are low…so find a way to manage your expectations but also, don’t compromise too much on your most important items. Your best bet is to select a few criteria that mean the most to you and prioritize those in your search. For example, you may want a safe neighborhood where your kids can run around (not located near a busy street) or a single-story home that is accessible for most visitors. The neighborhood you live in is almost as important as the house itself. Spend time in the area where you want to live and see if the lifestyle is for you. You should also consider various logistic criteria that could impact your life in a few years. For example, how are the schools in the area and how far is the commute to your work? Are property values increasing or decreasing in the neighborhood? You may find that your ideal houses are actually in a different part of town. Once you know what you want and where you want it, do some research and find an appropriate real estate agent. This person will show you the top homes in the area that meet your criteria. Your best bet for finding a good fit is to work with a Realtor® who is familiar with your home buying needs and has experience in your market. At Effective Agents, we use data to match home buyers with relevant Realtors®. This allows us to find someone who meets your needs, rather than a Realtor® who isn’t familiar with the area or who doesn’t normally show the type of homes you want. As your Realtor® takes you around to various houses, you will start to get an idea for what you want. Eventually, you will find a house that you are interested in buying. The first step is to put in an offer. Having an agent’s help with this is critical, making an offer is actually fairly complicated…there are a lot of required disclosures, timelines to adhere to and you really want to present your offer well. Depending on the market, you will likely put in an offer below their listing price. This kicks off the negotiation process, where the homeowner counters with an offer and you go back and forth until you reach an agreement. This is another time when a real estate agent can help answer your concerns on how to buy a house. They know how to navigate these negotiations and can tell you when they think an offer is too low or too high. Once your offer is accepted, return to your mortgage loan officer or bank to secure your mortgage. 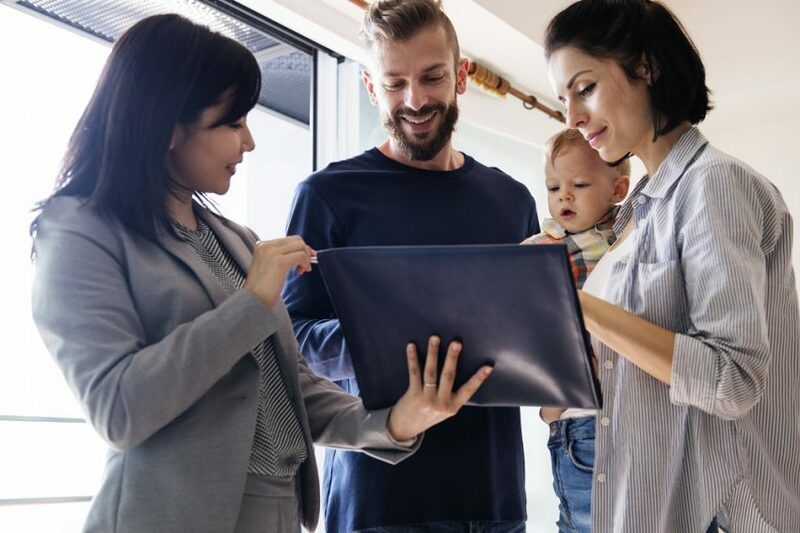 They will make sure that you have the necessary funds and income documentation to buy your house and will work with you on finalizing the loan product that’s right for you. This process is much easier if you already met with this person earlier when setting your budget. Before the mortgage is approved and funding occurs, you need to make sure that the contract price accurately represents the value of the house. This happens when you have the home appraised and inspected. The appraisal occurs when a third-party company reviews the value of the house to make sure the price is fair. The inspection looks for problems or issues in the home that the homeowner might not have told you. For example, the inspector might find a leak that has caused extensive water damage, lowering the value of the house. After thoroughly reviewing the home inspection, if necessary, your agent should be requesting concessions or reductions in the sale price for any deferred maintenance or previously unknown issues. If the appraisal is near or over the sale price and the inspection passes to your liking, you should be clear to buy the house. The final step in the home buying process is the closing. Your Realtor®, the title company or attorney and your mortgage professional will take over this part of the process. It can be rather complicated so it’s nice to put it in the hands of someone you can trust. Experienced Realtors® understand the closing process and can draw upon mortgage and title professionals, obtain the final paperwork for you to sign (mortgage documents, disclosures and conveyance documents). These steps might seem easy, but there are multiple details and elements in the home-buying process. Fortunately, with the right support system and an experienced Realtor®, you can learn how to buy a house and make the process as painless as possible. Contact Effective Agents today so we can match you with a Realtor® best suited to help you find the perfect home and guide you through all eight steps of the buying process.